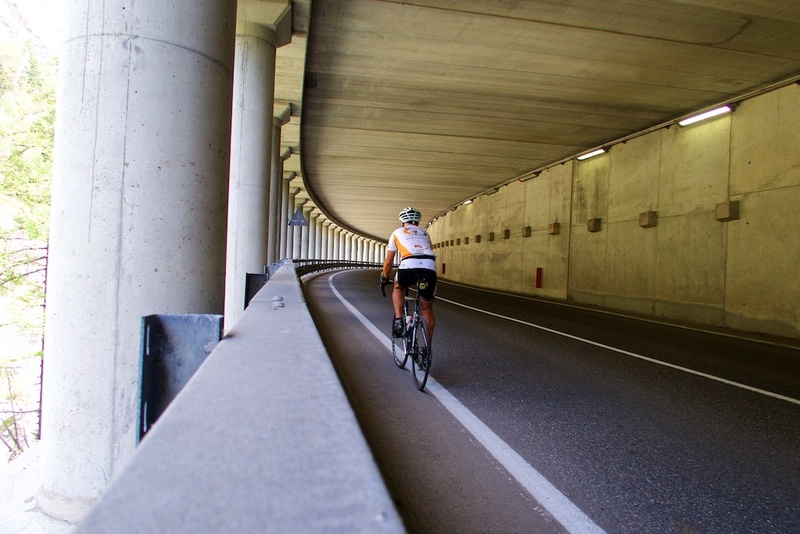 Travelling in Italy with my (very supportive) wife gave me the unique opportunity to ride the first 22 paved kilometres of this huge 35 kilometre climb with a road bike, then switch to a mountain bike for the real fun – ultimately climbing to above 2500 metres. The Cogne Valley is one of many interesting side “finger” valleys of the Val d’Aosta region in the Italian Alps near Mont Blanc (Monte Bianco). From Aymavilles far below, it’s a 22 kilometre climb to Lillaz (1617 metres), the end of the main road (3 flattish kilometres above Cogne). Then a little-known, slightly crazy, mainly unpaved “road,” winds up to the Rifugio Sogno di Berdzé (2531 metres). 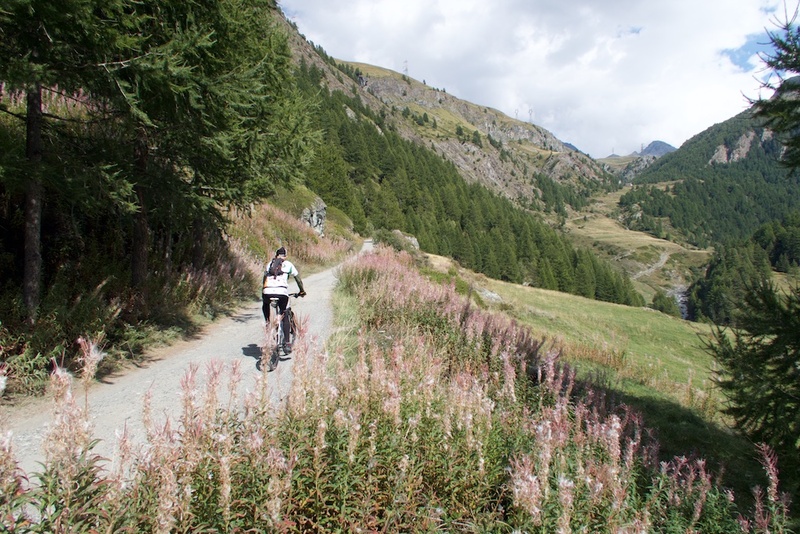 For a map of more climbs in the Aosta valley and Piemonte see here. Here are two profiles: The first is just the 22 paved kilometres to Lillaz. 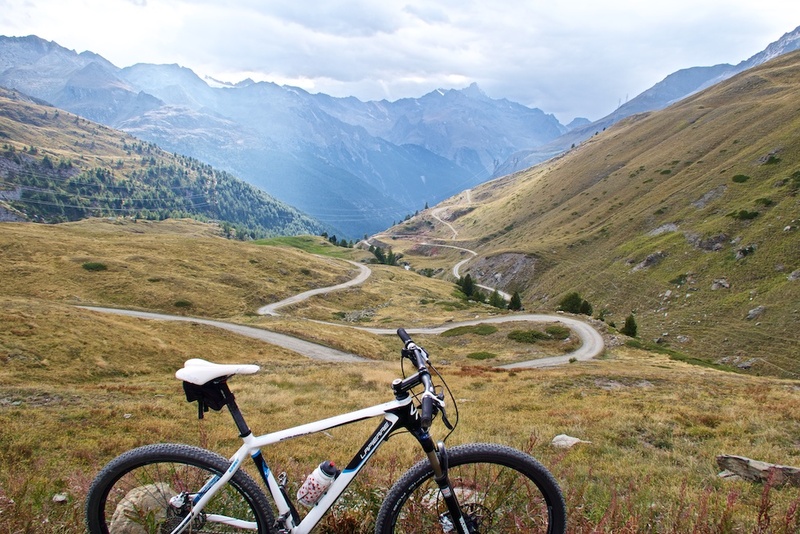 The second is the entire climb to Rifugio Sogno di Berdzé – which requires a mountain bike. The first 22 kilometres are on a wide, well-maintained, road – through a tight valley with few hairpins – but high mountains on both sides. It’s nice. It’s a very good climb. But ….. I can’t really recommend it because of all the tunnels / gallerias. Several unlit. I counted 9. 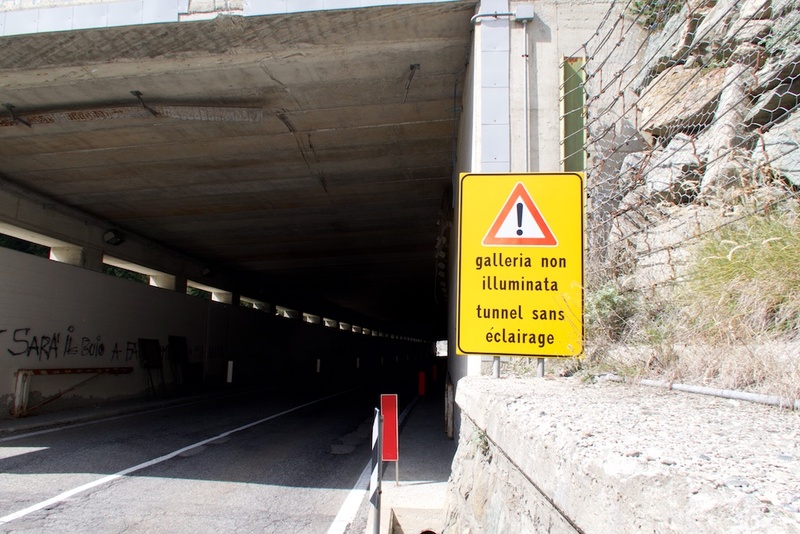 To be clear: NONE of them are very long (100 – 300 metres) and again the road is wide. It’s not really dangerous. It’s just not my thing. But to be clear, I understand most people will have zero issues with these short tunnels. This entire route spans the northern edge of the beautiful and huge Parco Nazionale Gran Paradiso. 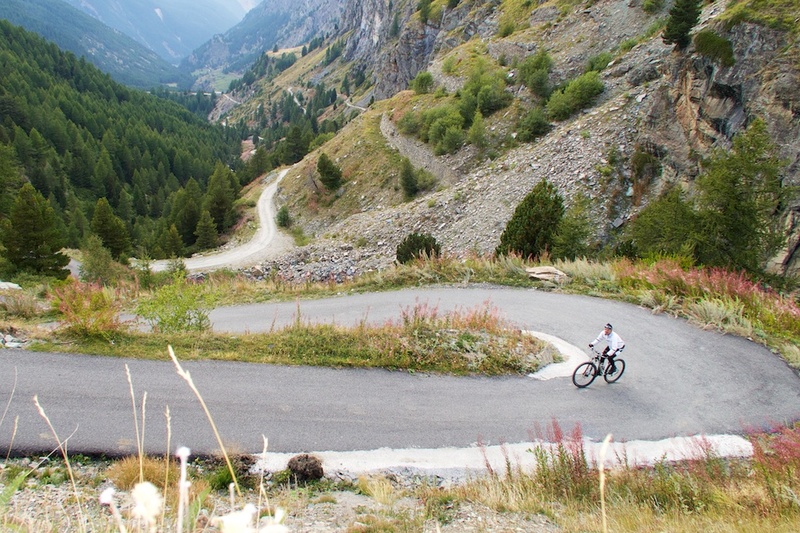 Perhaps my favourite cycling climb of all time is in the far side of the park: Colle del Nivolet – details here. 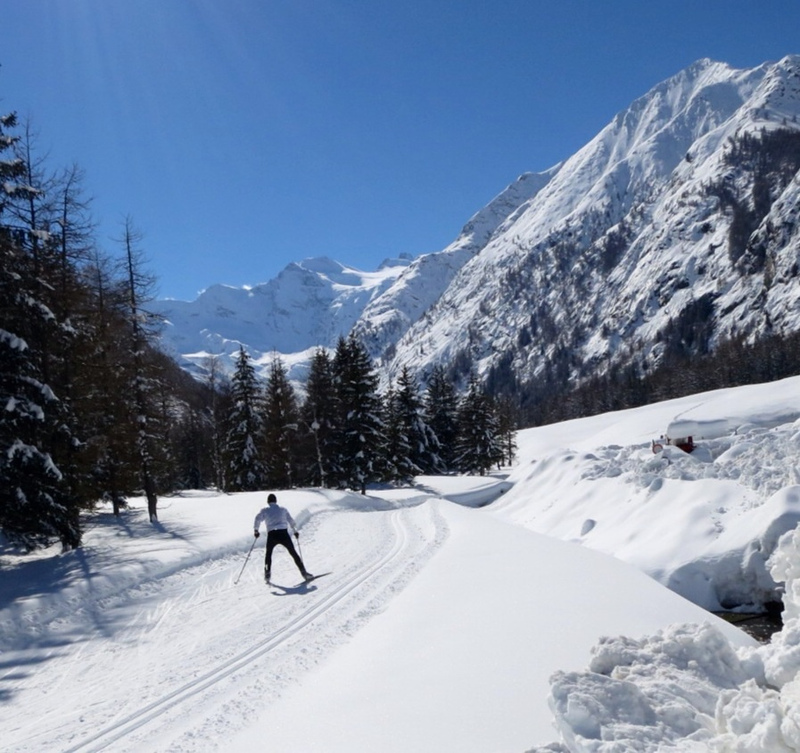 Cogne is a charming little village that is a small ski station in winter. I had been here once before to enjoy the fabulous cross-country skiing. 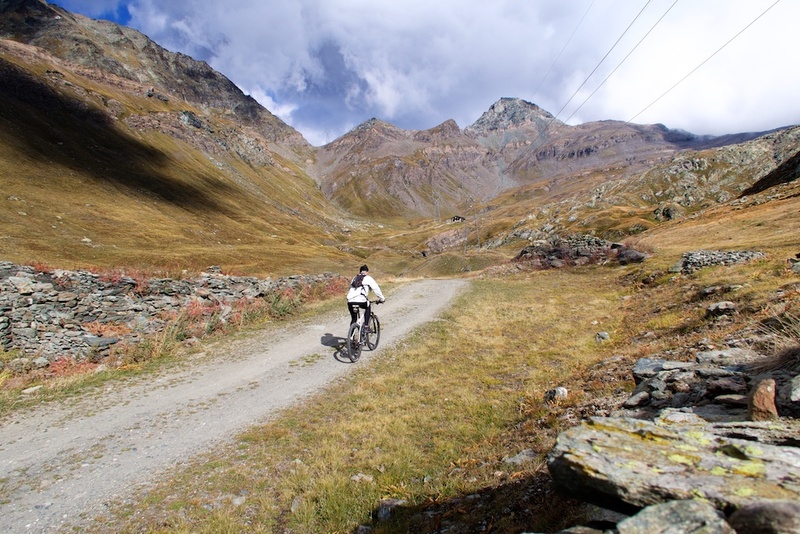 Once I reached Cogne, I put my road bike in the car, added some warmer clothes, and grabbed my mountain bike. 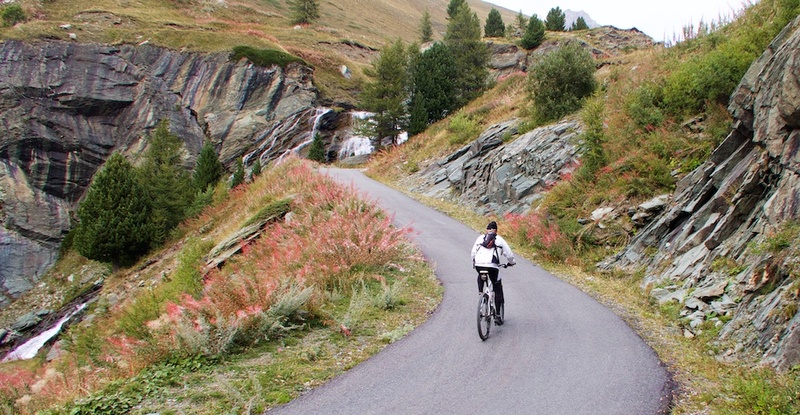 From Cogne, the main road continues for three more kilometres to Lillaz. 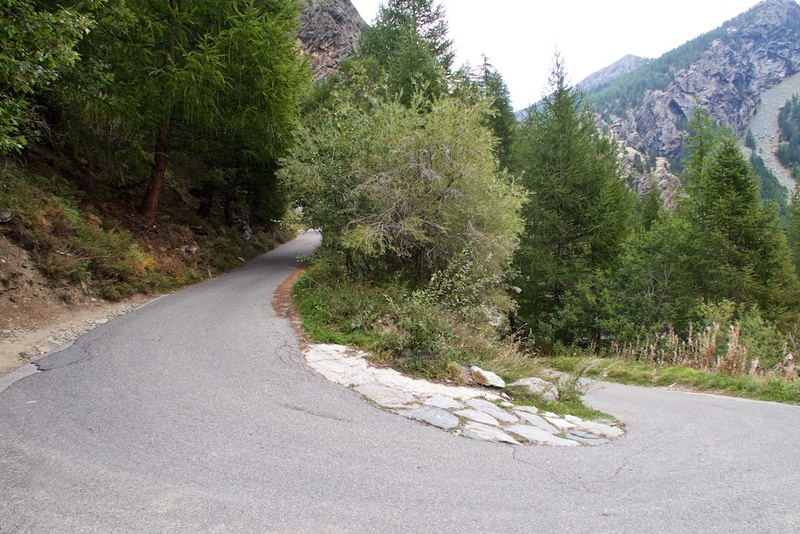 From there is an, easy to miss, little turn off onto a superb, tiny road that just heads higher and higher. 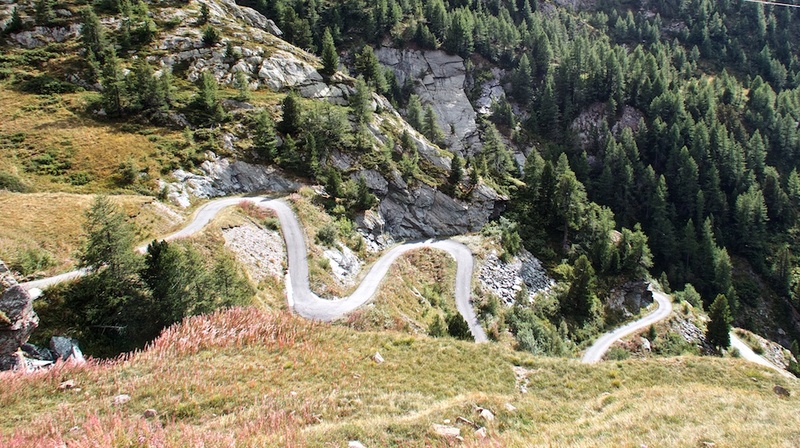 The first couple of kilometres while extremely narrow are paved – with perhaps 20 hairpins. Amazing. It’s tough to photograph as the route is in the trees and up against a cliff. But it’s superb. Next, the road just continues straight towards the high Alps. The weather wasn’t the best, but it is beautiful here. Super quiet, huge Alps, glaciers ahead, etc. The paved road ends at just below 1900 metres. 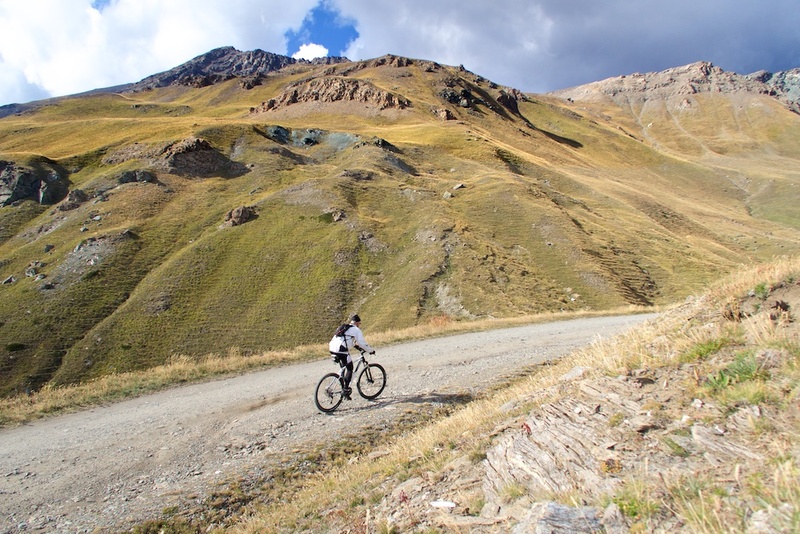 But several times throughout the route, after long ok quality rocky stretches, the road would suddenly be paved again. There are some amazing sections: Hairpins, waterfalls, snowy peaks, etc. There were several side roads along the way that seemed to go very high – possible future adventures. But I kept heading deeper into the mountains. The road ends at Rifugio Sogno di Berdzé – 2531 metres. The rifugio was open and a very fit elderly man greeted me kindly and made me a coffee. Perhaps it was signore Berdzé himself? He told me the rifugio was only open 3 months a year as the snow would reach 5-10 metres in winter. He also told me it’s possible to hike or carry the bike higher over a col behind the rifugio at approximately 2900 metres to reach a new valley. I must admit he seemed slightly disappointed that I was turning around. But I’d climbed almost 2000 metres and thoroughly enjoyed finding this lesser know super-high road. Woohoo. Maybe next time I’ll just keep going. Another great write up of another cool day out on the bike. Always look forward to reading new updates. I have to wonder though, in this case, why you wouldn’t use your CX bike for the second part of the climb! Was it because you didn’t know what the terrain was going to be like, as the pics of the gravel up top looked easily accessible by a gravel grinder? Yes, I had absolutely no clue as to the road surface – only that a map seemed to show a road there. The quality changed throughout and while pretty good, there were a few fairly lousy stretches. But 35c or may 32c tires would probably have been better. 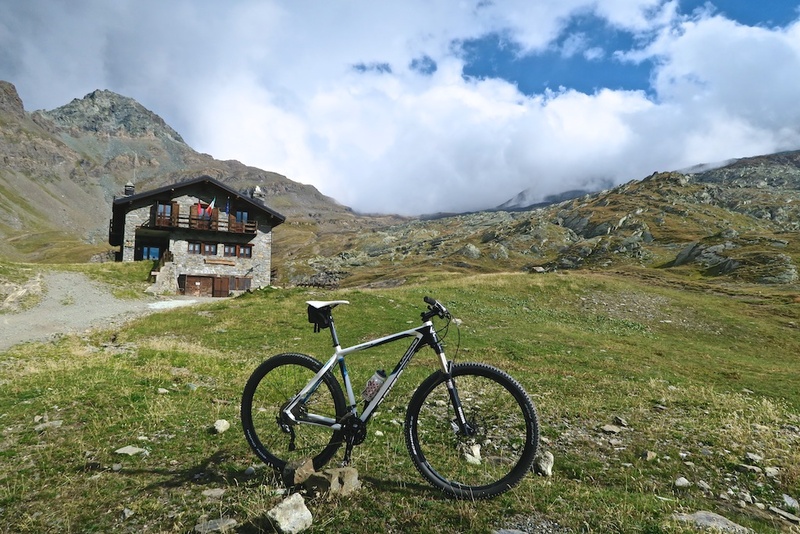 Looking at the map, I think that if you had carried the bike higher up like the man from the refuge hoped you would do, you’d have arrived at Lago Misérin (from another post of yours)… No?